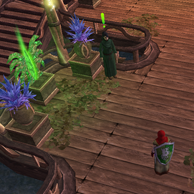 We've just updated the game with a patch that improves PvP Battlegrounds, Gathering, Crafting and the Eldevin Arena. It also includes a few more bug fixes. In addition we'd like to tell you that we've been listening to the community and our technical team have started work on a few exciting requested features. These include Guilds and less clicks when performing actions. We're also hard at work on a Christmas Event open to all players and early next year (February) we plan on increasing the level cap along with new content / dungeons and challenges. We hope your all enjoying the game! Keep the feedback and suggestions coming on the forums!